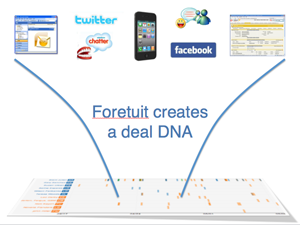 Foretuit combines your email, chatter, and other social feeds together with your salesforce.com opportunity history to create a “deal DNA” for every opportunity. Foretuit does this without manual data entry, so you don’t waste valuable time and effort on the losing battle of trying to keep data up-to-date in your CRM. Because Foretuit integrates right with your desktop applications such as Outlook, there’s no need for IT involvement – just join Foretuit and download the Desktop Link and you’ll be up and running in minutes. Foretuit sequences the DNA of all of your deals to find a unique fingerprint of the way you sell. Foretuit’s engine looks at every historical deal, looking for patterns that indicate the potential to win, lose, or slip a deal. Foretuit doesn’t force you to adopt a sales methodology or approach. Because Foretuit looks at your history, it automatically adapts to and learns the way you sell. 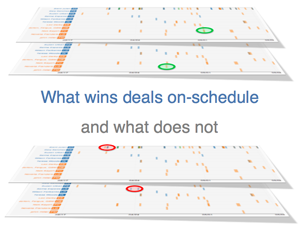 This allows Foretuit to provide accurate results for predicting whether your deals will be won or lost and whether they will slip or not. 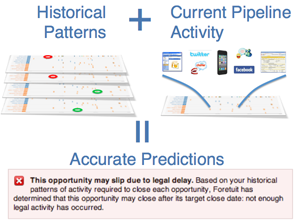 Foretuit applies your unique “fingerprint” learned from historical deals to predict whether the active deals in your pipeline will be won, lost, or slip – and why. Foretuit rolls up it’s overall prediction to automatically adjust your forecast to help you figure out whether you will make your quarter or not.